This page contains a selection of antique and vintage glass scent and perfume bottles from our stock of antique colored glass. If you cannot find what you are looking for we may have it, please ask. 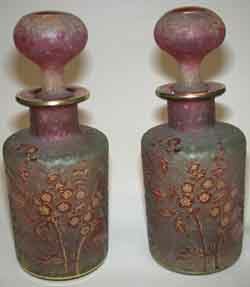 Scent bottles or perfume bottles as some people prefer to call them, are found in two types, laying down or free standing. 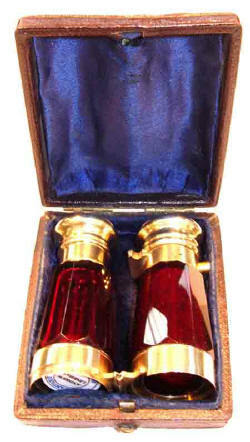 We always have Thomas Webb and Stuart English Cameo scent bottles in stock. Most of our stock is from the Victorian and Edwardian periods when the use of perfume bottles was at its height. Where the items have Registered Design Numbers some of the original designs are displayed on this page. To ask about availability please go to our contact page. the Sterling mounts for Starr and Co, New York (retailers). 6 1/2in (16cm) long approx. More Moser glass items can be found in Continental Glass - Moser. decorated with very fine gilding, France, c.1845, 9in (23cm) approx. the cranberry body polychrome enamelled with heart motifs, c.1880. the hourglass body of green cut through to clear, c.1885, 8in (18cm) approx. circa 1885, cut with fuschia flowers, silver mount, engraved 'Remember the Giver' around the neck, 2 3/4in (7cm) long, together with fitted case. A Novelty scent/smelling salts bottle, hinged to form 'Opera Glasses'. cranberry coloured glass with hinged gilt metal mounts, in original fitted case, c.1890. the silver gilt mounts with a victorian lozenge design registration mark (28 Nov 1883) to the domed base mount with ring keeper (for a chatelaine or ribbon) 2 1/2in (8cm) approx. very likely to be carved by F. Zach, decorated with a fabulous bird in ruby cut through to clear, with ornate jewelled silver mounts to rim and foot with 'keeper' chain between stopper and foot, the mounts encrusted with semi precious jewels in a Renaisance style, circa 1875.
enamelled with verdant foliage, gilt metal mounts. 2 3/4in (7.5cm) approx. of waisted cylindrical form, blue, over white, over cranberry, gilt metal mounts, Stourbridge or Bohemia, circa 1875, 1 3/4in (3.5cm) approx. A Continental silver novelty scent bottle in the form of a 'mandolin'. contained within a gilt metal wheelbarrow, circa 1895. £325. decorated with foliate 'c' scrolls in gilt and coloured enamels, 6 1/2in (16cm), Novy Bor, North Bohemia, circa 1845.
opening to reveal a pair of perfume bottles with hand painted views to top and original stoppers, the whole casket complete with original key, 7in (18cm) wide, circa 1855. 9in (23cm), France, circa 1868.
two colour on crystal, cut with fuschias and a butterfly, silver mounted, circa 1887, 3in x 2 1/4in (7 1/2 x 5 1/2cm), together with fitted case. moulded with the word POISON on the side and 4 oz on the bottom, original cork stopper, late 19th Century, 5 in (13cm.). £65. Strictly speaking this is not a perfume bottle, but alot of people buy these to decorate bathrooms etc, and the colour is very pretty! with three colour gold mount, c.1815-1825, 2 1/4in (6cm) high, together with filled case. This glass is also sometimes called Hortensia Glass. each well enamelled with a Classical soldier, 10in (35cm) high approx. 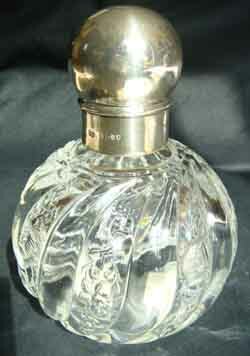 A Salviati 'Renaissance' double lipped scent bottle. green glass with applied glass in dark turquoise, 4in (10cm) approx, circa 1895. Originally the perfume would have been decanted into this flask from a large bottle and cork stoppers prevented the scent from evaporating. probably Harrach, c.1880, 8in (20.2cm) high. in pale blue jasper, sprigged with vignettes of different domestic scenes on each side. original fitted case, 5 7/8in (14.5cm) long, approx. In excellent condition. decorated with ferns and grasses, Stourbridge, England, c.1885, 2 3/4in (7cm), together with fitted case. gilded decoration, c.1825, 4 in high. The registration of the design can be viewed by clicking on the Registerd Design Numbers page. See the top of this page for link. with rare hallmarked silver 'flip' tail, Birmingham 1883 and registered design number Rd 15711 (refers to glass element only not the tail), 14cm (51/2in) long. See Registered Design Number link at the top of this page to display a copy of the registered design. white cut through to yellow, well carved with a design of wood anenomes, Russian gold and enamel mount, fitted case, circa 1885, 9in long approx.